Scanning the grid on TV this morning, I quickly scampered to the History Channel to catch an hour discussing sideshow freaks and geeks, P.T. Barnum and the like. 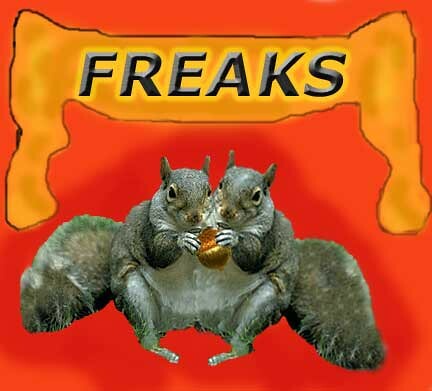 Nothing nabs the Squirrel Queen’s attention like a good freak show. Plenty of black and white footage depicting the glory days of the denizens of the sideshow. The barkers would have gotten all my dimes if I was wandering the Mid Way back in the day. Un PC, yeah, but I can’t help rubbernecking at the rubber-faced man and his ilk. It sent me searching around on the Internet to check out a little more. After Barnum’s “American Museum”, everybody knows Coney Island is the home of the barker and his wares. If you have an interest in learning the trade and hitting the road or want to learn how to swallow a sword, walk on glass. Step right up. They’ve got classes you can sign up for to release your own inner freak. If you’re more of a literal artiste, the same link will allow you to sign up for a class to learn to paint the banners that were huge billboards advertising the bearded ladies and alligator men on the Mid Way. If you can’t shake the mood and need to feed your geek, there are tons of links on the Coney Island site to both current sideshow attractions and their locations and to the historic sites that appreciate the glory days of the tallest woman and the tiniest General, Tom Thumb, and his kin. It’s a Rodent-a-palooza this vacation week. 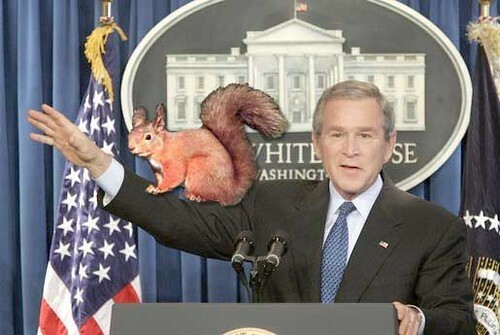 Tuesday, I spotted a squirrel trying to upstage Dumbya during his Oval Office press conference. The critter was scampering up and down a tree, visible through the window behind Chimpy. Then yesterday, I checked out several new T-shirts sporting the bushy-tailed beast available in retail establishments. It seems 100 percent cotton tees with witty slogans and imagery depicting tree-residing animals and their tasty, oak-originating treats are all the fashion rage. 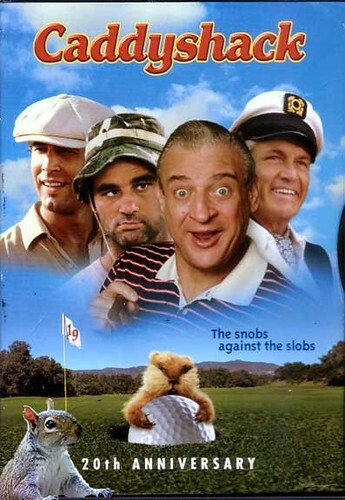 Now today, I get to watch a gopher, (cousin to the beloved squirrel) give Bill Murray fits and seizures in an airing of Caddyshack. Ah, the synergy of my week-long sabbatical is inspiring. The Squirrel Queen spent some of the morning checking her e-mail. I got my latest update from the Independent Film Channel. With my interest in samurai stuff, I was quick to check out their info on the new animated series Samurai 7. Immediately, something caught the astute eye of the Squirrel Queen. Samurai Kittens. With rodent quickness, I clicked upon the link and soon I was exacting righteous vengeance upon the offending kittens. My favorite weapon – lethal sword. My favorite furtality inflicted upon my opponent – the pool of blood. mwahhhaaaa. My only regret is that I cannot act out this Asian annihilation as my squirrel self. 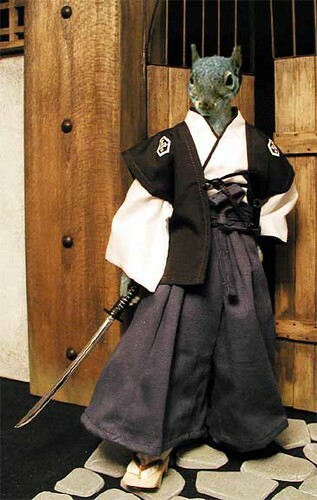 I must use a feline persona, beh. Kill some time, kill some kitties. My legion are always on guard to protect our best national interests. Diligent. Ever watchful. Where they are least expected. Like Tom Joad in “The Grapes of Wrath”, where injustice is done, they’ll be there. Yeterday morning I happened to catch the Chimpy McBush press conference in the Oval Office in which he waved bye-bye to Chief of Staff Andy Card. To my surprise, what did I espy in the window behind Shrub as he yammered on about the man who interrupted his reading of My Pet Goat? Scaling a tree in order to monitor the mumblings and rumblings of Dumbya was a squirrel. I’ve scoured the Internet in search of an image from the press conference displaying my legion in action, but apparently the stealthy patriot avoided all the still cameras in the press pool. So, if you come across such an image of the bumbler being watched by one of my tree climbers, send it to the Squirrel Queeen. The Squirrel Queen is on vacation. Woo Hoo. I was home over the weekend, but today is the first working day I’ve missed. Sweet. I’ve already watched about a million movies, imbibed adult beverages, watched sports and eaten food that’s truly bad for me. 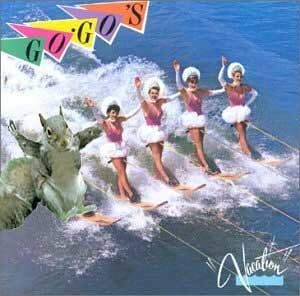 I’m not sure the weather will allow any water skiing during my vacation, but eveyone has seen the video and knows squirrels love water sports. Maybe I’ll wax up my skis and rev up the Johnson (vrroom, vroom) Hey, I’m talking outboard motors here, people, get your mind out of the gutter, come on, keep it clean. It’s the GoGos up there. Look at them. Wholesome, I tell you. Clean living. As squeaky clean as Walt Disney World. Ah, vacation. Living the good life. I’ve spent the bulk of the day holding down the couch and watching the underdogs rule the NCAA tourney. Who doesn’t root for the lower seed, unless ofcourse your favorite collegiate gang of five is facing the lesser known squad. About seven underdogs have ruined the favorites’ season and are vying for Cinderella status. I know I was just celebrating the end of my basketball coverage a week ago, but I don’t really watch a ton of games other than the ones I attend for work during the high school season. Once I’m done covering my teams, then I immerse myself in the games of teams outside my coverage area. 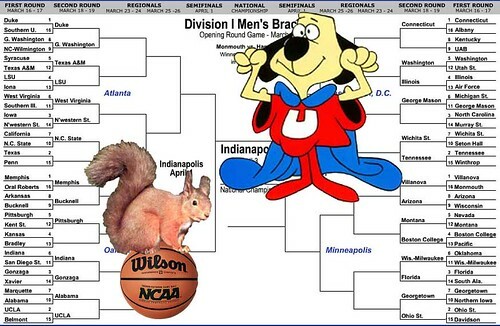 Just like everyone else, March Madness takes over my brain. I’m terrible at filling out brackets. It seems I always pick the wrong upsets, but it’s fun to try to predict none the less. I’ve got two more days of hoop hysteria ahead of me this weekend. Woo hoo. And remember, there’s no need to fear, the Underdogs are here. Happy St. Patty’s Day to you all. The beloved Irish may have driven all the snakes out of Ireland, but legend has it there are still a few green squirrels in the Emerald Isles. 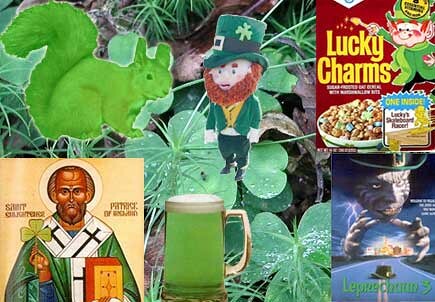 While surfing and googling for pieces for my St. Patrick’s Day masterpicece above, I came across this “scientific” site regarding a Lucky Charms experiment. It might inspire you on this special day. I’m staying in today as I misbehaved last night. I guess it was a pre-Green Day (not the band, but I do love them) celebration. I did have a Guiness and I went to The Pub, but not in pursuit of any sort of Irish connection to the coming holiday. Earlier in the previous evening, we attended a new restaurant that opened this week. They’ve still got some kinks to work out. Most of the food was excellent. Some dishes were just average, but there were a few things I’ll order again. This new establishment is trying to class up our little town a bit. High brow dining with a well-stocked bar and eclectic menu. There’s nothing wrong with that. The proprieter renovated an old building downtown that was built in 1897 and was once used as an Opera House, thus she had a new moniker for her restaurant. It took her about two years for the restoration. Brava to her on her effort.